Developed because the bar doesn't raise itself. Introducing the Ingersoll Rand ST150 Series mid-range turbine engine starter, a new and greatly improved turbine starter to replace the 150T Series. Packing a powerful 47 HP in a solid aluminum turbine motor, this new family of air starters is based on the patented next generation technology from the rugged, long lasting, easy to service, high performing and efficient ST1000 turbine starter. Built to withstand the toughest environmental and working conditions – combining robust features and flexibility to deliver reliable, heavy-duty starting in a wide variety of industrial, oil and gas, marine, power generation, rail, and mining applications. 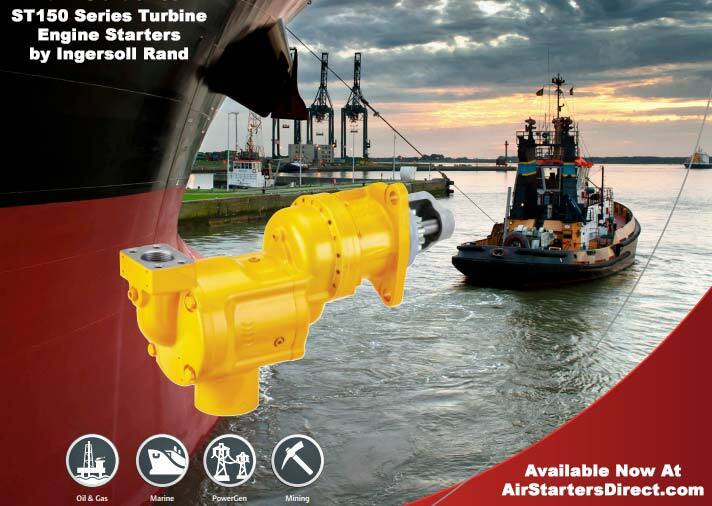 For over a half century, Ingersoll Rand has delivered the most reliable starters for use in the world’s most demanding industries and environments. Continuing with our legacy of innovation, Ingersoll Rand is proud to present a new series of turbine air starters to serve the mid-range engine market. The ST150 Series Turbine Air Starters pack a class leading 47HP solid aluminum turbine motor based on the patented next generation technology from the rugged, long lasting, easy to service, high performing and efficient ST1000 turbine starter. Built to withstand the toughest environmental and working conditions – combining robust features and flexibility to deliver reliable, heavy-duty starting in a wide variety of applications. - Solid billet aluminum turbine motor with robust fins and nozzles – heavy duty construction!